An ultimate all-in-one music manager to download music, transfer music between iPhone/iPad/iPod and iTunes/Mac, and clean up music collection. If you can’t download songs from a music site, then you can use the recording feature of iMusic to capture the audio. It is available to record music from radio stations as well. In a word, if you can play a song online or on your computer, then you can record it and save to your iTunes Library. Download and install iMusic on your computer. Launch it and click the "GET MUSIC" menu on the top of the software. Next, click the "RECORD" button. Click the "Record" button and prepare to record the song you’re going to play. You can open a web browser or an application on your computer to play the song you’re going to record. iMusic will detect the song and record it. During the process, the cover and artist for a record song will be added to the song automatically, making it quite easy for you to identify the songs in iTunes Library. Tips: you can try the Record feature while playing songs in iTunes radio station, Spotify, BBC radio stations, and so on. It works perfectly. 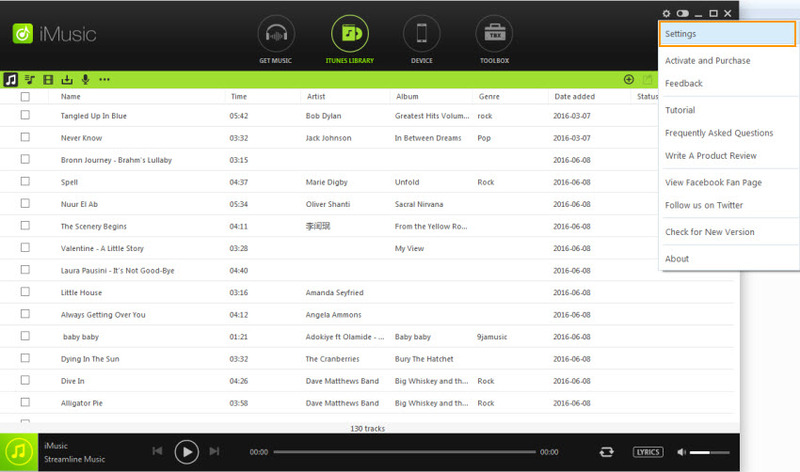 Click "LIBRARY" menu, then the record icon on the left side to check out the recorded songs. To add them to iPhone, iPod, iPad, and Android phones, check recorded songs > click export icon > select device to transfer (a device should be connected to the computer first). Question: the RECORD feature doesn't work on my Windows PC, what can I do? Answer: If you can not use the recording function of iMusic on your Windows PC, you must set up it manually. Step 1. Click the gear icon icon in the upper right of the window and select "Settings". Step 2. 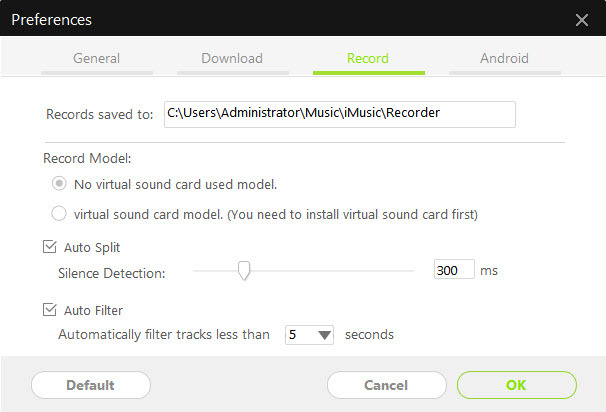 Click the Recording tab in the appeared window, and then choose "no virtual sound card used model". Click "OK" to apply the settings. Then you can restart the program to use the Record feature.